Okay. I'm sure all you dirty birds saw "spend time" in quotes and assumed that it was a euphemism for bumping uglies (which, of course, is also euphemism for something); but it's totally not. I actually mean "spend time". But it's in quotes because we might not actually be spending the exact same moments in time with each other. For whatever reason -- work, baby, chores, personal hygiene breaks, etc. -- my wife and I can't always be in the same room at the same time. 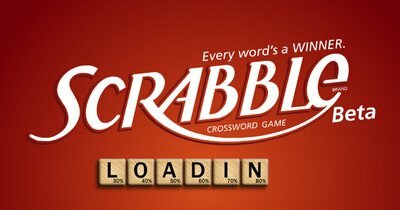 Facebook has been a shockingly functional way for us to still "spend time" together via Facebook apps; more specifically, through Facebook games like Scrabble or Scramble. You can start a game whenever you want and take turns whenever you have time. You can also save the smack talking for whenever is most convenient, too. Uh, I guess I should also admit that for some reason we've forsaken "real" Scrabble even when we are able to be in the same room at the same time. But it's kind of stupid because the Scrabble Facebook app is in beta and is obscenely buggy. We'd probably actually finish a real game of Scrabble much faster.